Around the world, people reportedly prefer local culture while there is a rising distrust on global institutions and information sources, including social media, according to “The Truth About Global Brands 2: Powered by the Streets,” a new study conducted in 29 countries. The research by McCann Worldgroup’s Truth Central global intelligence unit also reveals surprisingly that positive attitudes towards global brands have remained high, with people believing that brands can play a valuable role in contributing to local cultures. The study has defined the principle of Deep Globality: the awareness of, and efforts to spread a brand, idea or movement thoughtfully in a multi-market capacity while actively enriching the receiving culture. McCann Worldgroup Truth Central launched its initial study, “The Truth About Global Brands,” in 2015. The new Global Brands follow-up study, which also incorporates findings from McCann’s Truth About Street initiative that sent all 20,000 of the agency network’s employees out last October to interview consumers, shows a rising cynicism and pessimism on both and institutional and individual basis. Globally consumers have a sharply rising distrust in institutions at 72%, while in the Philippines 71% of people believe that global institutions like the World Bank and the UN don’t understand the needs of their country — and are generally more pessimistic and more distrustful of their own fellow citizens. When it comes to politics and government, 58% around the globe believe that they are less truthful while it is higher in the Philippines at 68%. 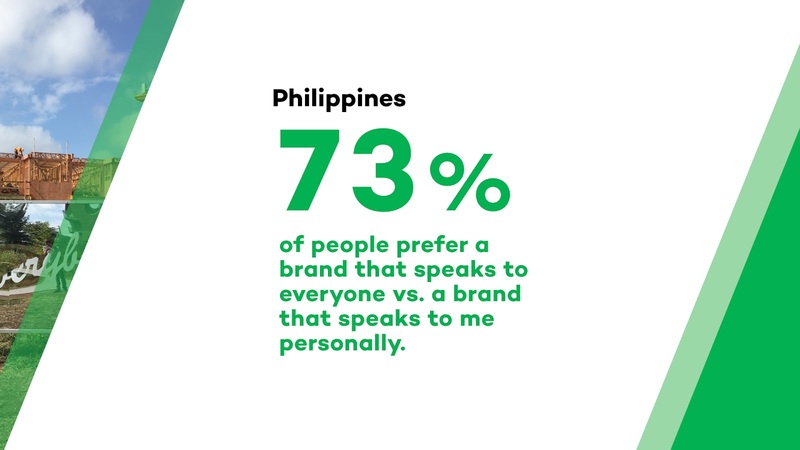 Communication platforms like social media is also now being re-evaluated with 77% of its users globally and tied at 77% for its users from the Philippines, whom believed that although it is meant to bring us together it is now dividing us. With the rise of political tensions, powerful sociocultural movements and even natural disasters around the world, they have seen that people are no longer willing to accept the status quo everything is being questioned today. People think that their country is in a state of conflict, at a global average of 57% while it much higher in the Philippines at 63%. The trust in institutions, politicians and platforms has decreased. In this context, it is hardly surprising that 72% of people believe “it’s more important to put the truth before other factors in all situations,” up from 61% in 2015. In the Philippines, it rose from 61% to 70%. Another critical data point, in the age where news sources are being challenged, is that consumers across the globe believe that “truth is the most valuable currency” in all conversations—public, private, across social media and anywhere in the economy. But on global average, consumers believe they need to review 5 information (while 3.8 in the Philippines) sources in order to feel like they know “the truth” about any subject. Conversely, the study found that attitudes towards brands have not suffered from the same negativity affecting people’s overall views, and in fact represent a counterbalance to political and institutional distrust. Brands are seen in a relatively optimistic light. Globally, people have more than double the amount of trust in companies (from technology companies to supermarkets) than in politicians at 81% while in the Philippines it is higher at 88%. The people are open to brands playing a broader role in society. In their minds brand are supposed to spread laughter joy and happiness, bring people together by helping to eliminate prejudice and stereotype and encourage people to adapt a healthy lifestyle. They also maintain that global brands that contribute to their local culture and society are viewed with the same favorability. At the same time, the conditions affecting brands have changed. A majority of consumers around the world (56%) say they now trust local brands over global brands—up sharply from 43% in 2015. This presents brands with both a strategic challenge and a great opportunity to connect with consumers in a meaningful way. Local over global: Global brands continue to face hyper-local marketing pressure. While consumers increasingly trust what they perceive as local brands more than those seen as global, 72% of consumers are open to brands playing “a bigger role in society.” This includes opportunities for all brands to engage people in a hyper-local way by respecting local culture, helping people get access to products and services on the local level, providing jobs in markets where they operate/are sold, and operating sustainable businesses. The empathy gap: Intolerance and pessimism are rising; more people are “retreating” and becoming more selfish. However, while intolerance and pessimism are on the rise in all regions, people unexpectedly report being more positive about their personal lives. The research also contains perspectives and guidelines for global brands on how to remain effective in reaching consumers around the world even as people embrace preferences that are more local. Despite rising levels of distrust about global brands vs. local brands, brands still maintain a relative position of trust—in part because trust in institutions has dropped to historically low levels. People still have double the amount of trust in corporations than in politicians. The rise in intolerance among groups provides brands with a powerful opportunity to serve as a bridge across the empathy gap. The world is becoming more diverse. And diversity is a broader concept than is commonly understood. Diversity can mean very different things to different people, depending on the country, culture and context, amongst multiple other variables. Modern brands can learn from local brands and behave in ways that engage and increase trust. Powerful ideas that bridge cultures can spread the appeal of a brand if it actively enriches the “receiving” cultures. Only brands that truly understand the granular, local reality of a culture can connect with its people. McCann Worldgroup’s Truth about Global Brands 2: Powered by the Streets study explores both the macro cultural forces, and the deeply localized nuances affecting brands, people and the marketing landscape today. Conducted by McCann Worldgroup Truth Central, the organization’s global intelligence unit, this large-scale quantitative study surveyed more than 24,000 people in 29 countries. * For the qualitative component of the research, McCann Worldgroup’s entire global network took to the streets over a 24-hour period to deeply understand local culture in over 70 markets. This unique consumer research methodology resulted in a one-of-a-kind roadmap for how global and local brands can respond and thrive in today’s complex and ever-changing landscape. It's actually a nice and helpful piece of info. I am happy that you simply shared this useful information with us. Please stay us up to date like this. Thanks for sharing.